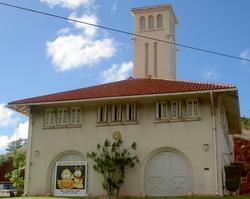 The original Kaimuki Fire Station, housing Engine Company No. 5, was completed in 1924 at a cost of $29,478. In 1992, and extensive renovation project to house an engine and a ladder company began. The expansion section includes a two-bay apparatus section and two dormitories with locker room facilities on the second floor. The project cost a total of $2,300,000. The original station is on the National Historic Registry and has been restored to its original condition. Engine Company No. 5 and Ladder Company determineNo. 5 moved into its expanded and renovated quarters in October 1996.